Robert Pirsig and his son, Chris, posed while on their trip from Minneapolis to San Francisco. Sadly, in 1979, Chris was stabbed to death during a mugging outside the San Francisco Zen Center. I have book club tonight, and the book we’ve chosen to read is Robert Pirsig’s Zen and the Art of Motorcycle Maintenance. It’s been at least 15 years since I last read the book, but it holds up as a good layman’s introduction to many of the foundational issues of philosophy. Zen is a writer’s book, to be sure – interesting structure, flashbacks and flash forwards, and a conversational style that draws you in and keeps you engaged in prose that could turn deadly in the hands of a lesser writer. It tells the story of the author, who became so absorbed with knotty questions of philosophy that he had to be brought back to reality with shock therapy treatment (or so his doctors believed). Specifically, it focuses on a motorcycle trip that he and his son, Chris, took in 1967 from Minneapolis to San Francisco. 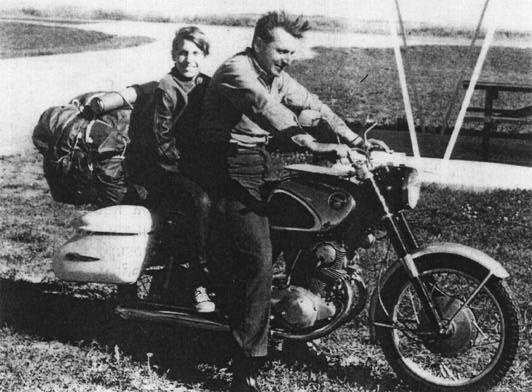 Along the way, Pirsig reveals the line of inquiry that ultimately led him to a nervous breakdown. His discussions of some of philosophy’s great issues are alone worth the price of the book, and his exploration of why some people hate and some people love technology still rings true. Chris brings out the paper again. “Now, help me,” he says. “Okay,” I say. I tell him getting stuck is the commonest trouble of all. Usually, I say, your mind gets stuck when you’re trying to do too many things at once. What you have to do is try not to force words to come. That just gets you more stuck. What you have to do now is separate out the things and do them one at a time. You’re trying to think of what to say and what to say first at the same time and that’s too hard. So separate them out. Just make a list of all the things you want to say in any old order. Then later we’ll figure out the right order. “Like what things?” he asks. “Okay, write that down,” I say. Then I see him write down another item, then another, while I finish my cigarette and coffee. He goes through three sheets of paper, listing things he wants to say. “I’ll never get this in one letter,” he says. He sees me laugh and frowns. I say, “Just pick out the best things.” Then we head outside and onto the motorcycle again. Next time you’re trying to overcome writer’s block, try Pirsig’s advice. You’ll be writing in no time. This entry was posted in Communications and tagged Robert Pirsig, writer's block, Zen and the Art of Motorcycle Maintenance. Bookmark the permalink.